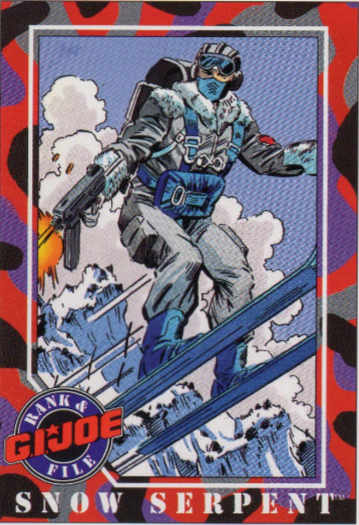 Spring may be in the air, but this week we focus on Cobra’s version of the Winter Soldier. 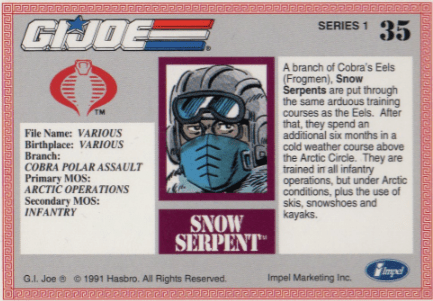 The Impel Trading Card #35 is the Snow Serpent. 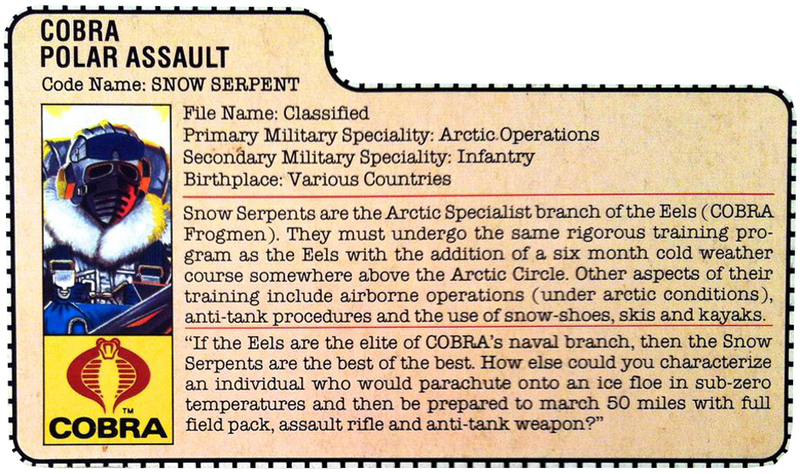 The Snow Vipers appear to be a branch of the Cobra Eels. I guess snow is frozen water, so you could argue this is a logical next step for some of the Eels that like to have their asses frozen off. The Action Figure has had 10 iterations released. The one on the Impel Trading Card is sporting the v1 style of 1985 (later reprised in the v7-10). I must say that this is a great look for a cold weather operative. Fur details, ski mask, snow shoes. Grey, white and blue colour scheme. It’s working for me. The 2nd version of the figure, however, was released in the colourful early 90’s and had a lot of yellow. Yellow snow jokes aside, the Joes also had a Tiger Force Blizzard figure that was even brighter yellow. The later figures went back to a more normal colouring and used lots of white, grey and blue again. Next time we stay close to home with a character we all love to hate with European roots. Stay tuned! Author European JoePosted on April 28, 2017 Categories G.I. Joe, TCGTags #35, cobra, gijoe, impel trading cardsLeave a comment on Do you want to build a snowman? We are back with a BANG, BANG! This week we have Captain Grid-Iron’s former classmate featuring the blog post. What better way to introduce this fan favourite (please ignore the sarcasm), than the following video (bad quality, I know, but hey, so is the character). 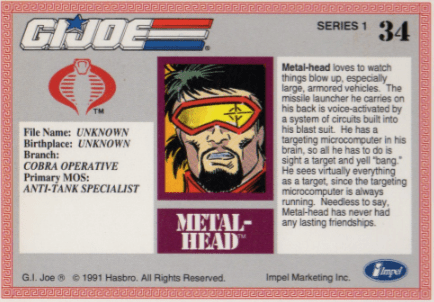 Ladies and Gentlemen, please give a warm welcome to Impel Trading Card #34, Metal-Head. What’s there to say about this character? I’m not a huge fan of him. Mainly because when I think of Metal-Head, the only memory that springs to mind, is that awful DIC cartoon. Although I have to say that he does remind me of someone else. Take a look at the guy and tell me you don’t see the resemblance with Commander William T. Riker of the Federation Starship Enterprise. I mean, look at them! Even the uniform is practically a copy. Granted, Commander Riker is less of a nutcase. But still, I think Larry had been watching a little too much of TNG when he cooked up Metal-Head. There have been 4 versions of the figure released, starting with the original one in 1990. 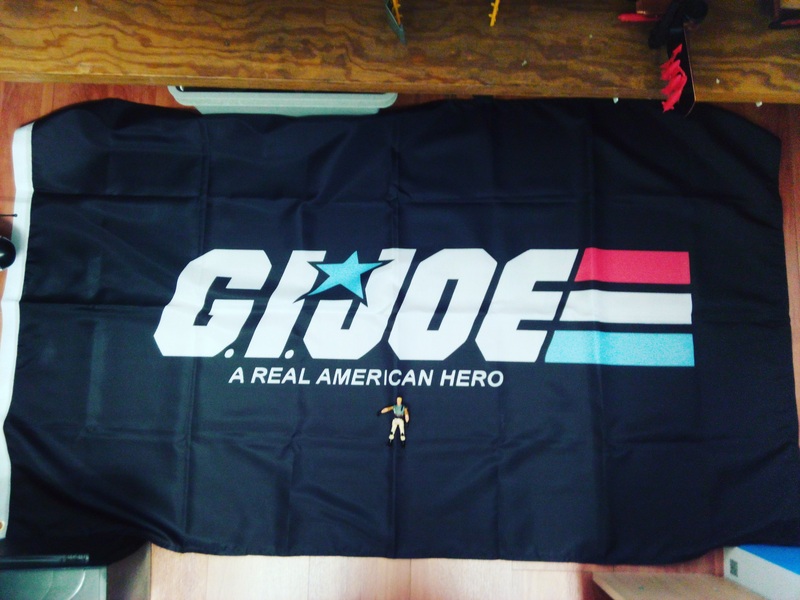 The last one was released as part of the 2015 International G.I.Joe Convention, organised in Springfield, IL. The exclusive Tiger Force versus Destro´s Iron Grenadiers box set from the Official G.I. Joe Collectors’ Club also collected Sgt. Stalker, Dial-Tone, Big Brawler, Wreckage, Recondo, Edwin “Lifeline” Steen, General Mayhem, Undertow Officer, three Iron Anvils and three Undertow. Personally, I like Destro having his own little army. After all, he does have the need for some personal security and with the customers he supplies, I know I would feel safer having a personal army to defend myself in case they are not happy with a product or in case they want to try and steal some new prototype. In the ARAH comic books, Metal-Head first appeared working for Cobra but spying for Destro. I don´t recall him being in a lot of stories, so not much more to tell. I´ll have to reread them again. I won´t go into the cartoons here since I´d like to remove the memory of Metal-Head in the cartoons. Next time, it´s time for some chill (sadly G.I.Joe is no longer on Netflix – at least not over here). Author European JoePosted on April 23, 2017 Categories G.I. 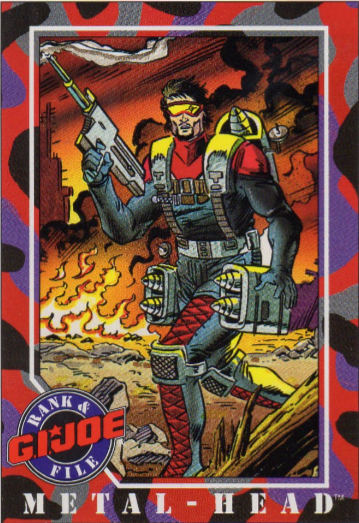 JoeTags #34, cobra, gijoe, impel trading cards1 Comment on We are back with a BANG, BANG! I will keep looking for that Holy Grail of us Joe collectors, but for now, it’s a far away dream for me so I’ll settle for everything else I can find!